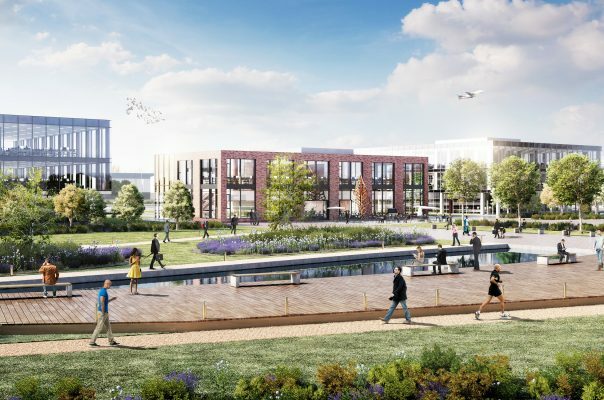 Our designs for two new office buildings and a car park at Airport City Manchester have been submitted for planning to support the continued growth of this important development project. The glass and steel six storey offices will offer a combined floorspace of 184,000 sq ft of Grade A space with co-working spaces in the ground floor and amenities such as a cycle storage. The new multi-storey car park will provide a total of 1,497 car parking spaces across eight levels for office workers and hotel guests, along with ground floor commercial units. It will feature ‘pleated’ anodised aluminium panels on the exterior that are perforated to allow natural light to enter during the day. The plans also include extensive landscaping and public realm with seating areas and raised planting and a new ‘landing’ area for the 5plus designed Cor-Ten steel pedestrian and cycle bridge over the M56 spur road, linking the site to the airport’s transport interchange and terminals. The first of the office buildings could be complete by mid-2021. Our masterplan has proved flexible enough to meet the demands of the redevelopment of T2 and major occupier led interest and we look forward to delivering these buildings and the next stage of the transformation of Airport City.